As users shift towards wireless peripherals and accessories that work over Bluetooth instead of a physical connection, more people are discovering power-related inconveniences associated with the hardware. The devices periodically run out of power, requiring users either to connect them to a cable to recharge or to replace the batteries, a process that could waste a few minutes of time if spare batteries are available for use. While wireless charging can be one solution, by temporarily placing the keyboard or mouse on a charging pad between computing sessions, it however means that users need to remember to move the keyboard and mouse to the charging pad each time. As most people would prefer to have the keyboard in position ready for typing, it is likely users may encounter drained peripherals if they were left out after use without being placed on the pad. 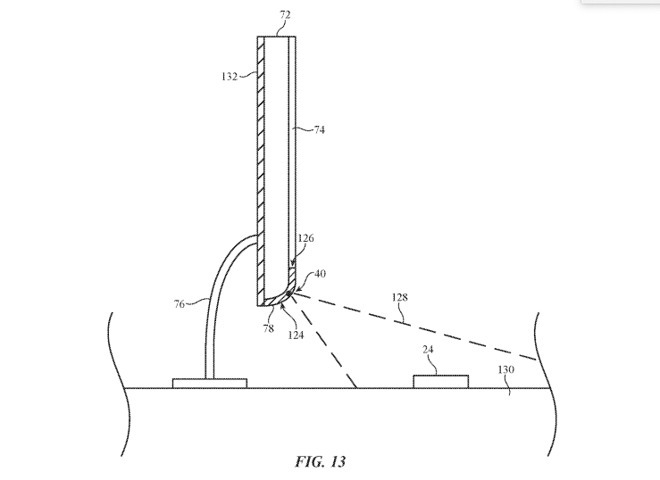 In a patent application published by the US Patent and Trademark Office on Thursday, Apple's concept for a "Wireless Charging System with Radio-Frequency Antennas" attempts to solve the issue. Rather than relying on a charging coil in a device being in close proximity to a charging pad, Apple's solution instead allows for the charging to take place over a short distance, such as within a foot of the charging point. A host device, like an iMac or display, could have cavities low down below the display that house transmitting antennas used for sending power. A secondary antenna on the receiving device, namely the keyboard or mouse, would receive the signals from the transmitter, which would be fed into rectifier circuitry and converted to a voltage that would be used to charge a battery. 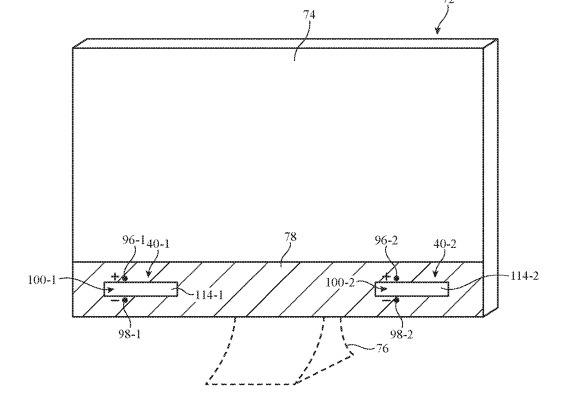 Apple envisions the transmitter could take the form of a rectangular hole exposing a conductive casing, as well as the antenna, which is all covered by a transparent cover layer to protect the user. The receiving device may also have a similar cavity, or use an "inverted-F antenna," as well as protective materials. The position on the display would make such a system ideal for charging nearby items, as it could be angled to cover an area of a desk without exposing the user directly to its transmissions. 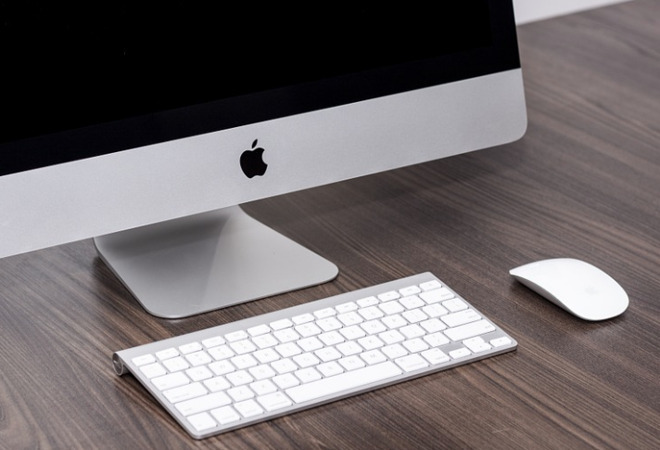 An iMac may not necessarily be limited to just one transmitter, as Apple suggests the use of one in the bottom-left and bottom-right corners, increasing the coverage area. Apple does file numerous patent applications with the USPTO on a weekly basis, but while it offers a clue as to where Apple's interests lie, it is not a guarantee that the concept will make an appearance in a future Apple product or service. Wireless charging over a distance is an idea that has been explored elsewhere, in part due to how potentially useful and lucrative a system would be to the company that produces it. For example, Powercast showed off its far-field charging technology to recharge devices in December 2017, with claims it could work at quite far distances of up to 80 feet away. Apple has also previously looked at the concept, under a 2017 patent application for "Wireless Charging and Communications System with Dual-Frequency Patch Antennas." In that filing, Apple suggests how power could be transferred over any suitable wireless communications link, including cellular and Wi-Fi, meaning the same single transmission could be used for both data and power. In theory, this would enable Wi-Fi routers to recharge devices at a distance. NICE!!! I want them now. This is probably will be Bluetooth 8 or something to make it happens. Tesla's (the inventor) vision is starting to take shape. I must admit I don’t really find wireless charging mats all that interesting, not really that much better than just plugging my iPhone in when I go to bed. This on the other hand...just chuck it on the desk, and it charges. That would be good. that said, this seems like it would only work for low power devices like keyboards and mice. Apple creating an expensive solution to a problem they created (by making keyboards and mice rechargeable instead using batteries, which lasted much longer). Apple has been "working" on this tech for several years now. In fact, this patent was filed in 2015. This is my idea of real wireless charging. Setting a device in a fairly specific location to charge is less then ideal, in fact it's worse than wired charging, because at least you can still pick the device up and use it while it's charging. This is most likely the evolution of Energous' Watt Up tech licensed to Dialog Semi in conjunction with Apple's deal with Dialog. The tech mentioned in the article is probably Energous's Mid Field Transmitter (transmits power up to 1 meter). At 1:08 in the video, it directly references this tech in relation to computers. 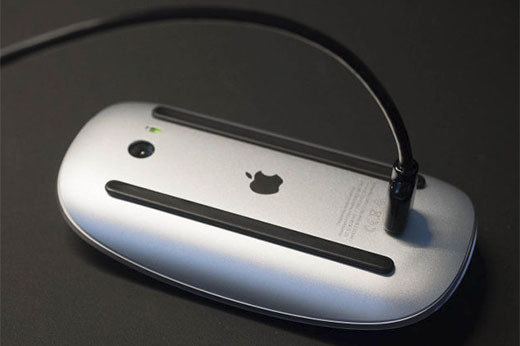 Not so with the Magic Mouse, where Apple, in their infinite wisdom, decided to put the Lightning charge port on the BOTTOM of the mouse instead of at the head so you can still use it while it's recharging. The product of highly paid engineers. ...in fact it's worse than wired charging, because at least you can still pick the device up and use it while it's charging. I have Apple Wireless Mouse 2. You can't charge it while using it. It baffles me tremendously. I still have Apple Mouse 1 as a backup. It's funny, I just had to replace the batteries in my iMac's trackpad yesterday. For whatever reason, it's been burning through AA batteries and I thought that it would be great to have a more seamless process for keeping it charged. For the small amount of charge needed to run a keyboard and trackpad or mouse, the wireless charge may actually be enough to keep the devices running with just a very small battery to make startup happen faster. As if we don't have enough radiation in our environment, and 5G will not make it better. Some of us remember a (not very distant) time when a keyboard and mouse could be had from Apple at 1/3 of the current price. They all came with a cable. This is a good place to start with this technology, because it will be extremely low power and low range. You don’t need much to keep a keyboard and mouse operating. This is way if doesn’t kill anyone in the first few years, we can look at going further with it. Yea but what you’re using isn’t even current. The newer Magic Trackpad is a dream. Entirely force touch, and recharges via Lightning, maybe once per 2 months. Keeping a lightning cable dangling nearby isn’t exactly uncommon or inconvenient either. There is nothing baffling about at it all. The mouse needs to be charged maybe once a month, for a few minutes. The entire design of the mouse would have been compromised by doing something as ridiculous as putting the port on the front of it, just so people like you could do something they don’t need to do in the first place. I'd say that's a given. The comment of highly uneducated bloggers. The iMac's footpad would make for a good contact (wireless) charger. Make it a little wider (or a lot wider) to accommodate the keyboard and mouse when not in use for charging. for half an hour in the middle of a work session. I'd prefer a mouse that could have a cable attached for charing while being used. Just last night my local NBC station presented a consumer piece asking whether Apple’s AirPods cause cancer. Why they singled out Apple I understand but it made it look like only Apple’s product was under scrutiny. Expect to see more of these questionable reports in the future. More research is needed of course but the public is inclined to believe anything it sees or hears. Transmitting power over the air will drive the “everything causes cancer” believers bonkers. Nuts. I’ve owned both Apple keyboards and mice with the old removable AA batteries, and the new Lightning rechargeable. It’s way better now. They last a super long time, I can plug them in to the Mac once every month or two at the end of the day, and they quick-charge in a minute if I’ve forgotten to. Way better. Wrong. The entire top and front of the mouse is the touch surface, so putting a hole there ruins it. In my experience the only people with your complaint are people who don’t own and use the mouse daily. I do. It gets months on a full charge. If i’ve forgotten to charge it, 1-2 mins quick charge while I read an email or get a coffee or pee and it’s good for the day. You don’t have 1-2 minutes to spare? Uh huh. Entirely worth the supposed compromise.